Sometimes, these holes in our teeth may fly under the radar. Nevertheless, many cavities can impart symptoms that may make you feel like your mouth is falling apart. Our dentist Dr. Andres de Cardenas wants to share some signs of a cavity that should catch your attention. If you deal with any of the following, enlist professional treatment right away before the cavity can spread! Tooth decay is the leading cause of toothaches. However, it can also occur due to an injured tooth, and even a sinus infection. 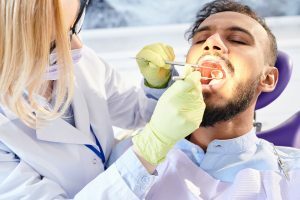 Nonetheless, if a toothache suddenly comes on strong with nothing out of the ordinary in your health, this could represent one of the telling signs of a cavity. Once cavities get through the enamel, they will continue drilling down into the next layer of dentin. A cavity may even reach the center of the tooth called the pulp. When this occurs, the area may become inflamed and cause notable pain. Some people possess naturally sensitive teeth. Unfortunately, this is also a very common cavity symptom. As cavities make their way down into the dentin, hollow canals called tubules enable particularly acidic, cold, hot, sticky, and sweet foods to stimulate the nerves and cells inside the teeth. As you can probably guess, this feels about as awful as it sounds. It is essential to visit a dental professional regarding abnormal, or out of the ordinary tooth sensitivity. If you feel actual pain, you are likely experiencing signs of a cavity advancing. When cavities form, they will display as small white spots on the surface of the teeth. As erosion increases, the cavity will burrow into the tooth and create a hole or pit that you may see in the mirror. This is the clearest symptom of a cavity requiring dental assistance. If you drink coffee every day or use tobacco, you may notice darkened spots or stains on your teeth. However, if you discover a discoloration with varying hue from the rest of your teeth, this is a sign of tooth decay. Cavities first reveal themselves as little white marks. Nevertheless, as they continue degrading teeth, they will pick up stains from foods and beverages. Pain when biting is not only the last of our signs of a cavity but another potential symptom of inflamed tooth pulp. This might indicate that the tooth pulp has died to infection and is not putting pressure on the root beneath. The root connects to the bone underneath that keeps your teeth in place. As a result, this can lead to substantial pain. Nevertheless, this could also serve as a sign that your tooth is cracked. No matter the cause, if you suffer from this issue, you require professional dental help immediately. Even if you had a cavity before, you might not know what to look for when one appears inside of your mouth. However, by going over these 5 signs of a cavity, you can wield some knowledge about when professional dental intervention is necessary. 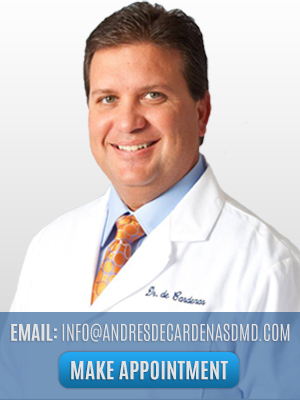 If you suspect you suffer from a cavity, contact Dr. Andres de Cardenas as soon as possible. The sooner you reach out to a qualified dental professional, the better chance you wield to deal with your issue!